For 72 minutes, I sat watching this game in dread, like an injured seal just waiting to be picked off. Like almost every game this season, the Warriors looked like the most talented team on the park — at times they seemed like the only team actually trying to win — but the way the Sharks were grinding forward, kicking goals, edging ahead, it just felt like somehow Cronulla were going to get the two points. But then the feeding frenzy began. Shaun Johnson magic put Solomone Kata over in the corner, but then Johnson knocked-on off the kick-off and I didn’t dare move a muscle. Defenders hung off Fifita, and, like a Great White searching for easy prey, he took a bite out of Chad Townsend before leaving Dominique Peyroux in his wake as he crashed over. In the NRL Warrior living room, the jersey went over the head, Brett Kimmorley went to mute (something that should have happened much, much sooner) and a horrible, sinking feeling filled the stomach. The next minute was tough. The eyes wanted to stay closed, wanted some relief from watching those last few painful breaths before the Warriors bled out and lifelessly floated to the surface. Couch cushions took a hammering, fists were pumped, voices were raised, arms were thrust toward the roof. There may have been dancing, shaking or shimmying of some sort. Then, after rewinding and watching, then rewinding and watching, then rewinding and watching the last two minutes — over and over again — it dawned on me that there is still life in this season yet. The Warriors were in the Top 8. I even sat through my first full episode of The After Match. Yes, I agree, it is remarkable that anyone could sit through an entire show, but, as I’ve mentioned, things were happening outside of my control. 1) I heart Ryan Hoffman. What a heroic play. That’s the kind of effort-play from a man who isn’t used to losing, and who knows that the game is there to be won until that final whistle goes. If there’s anyone out there who still thinks The Hoff wasn’t a superb signing, please find psychiatric help immediately. 2) If we’re being critical, this was a game the Warriors should have sewn up before the Hoffman/Johnson heroics. Solomone Kata, for all the good things he did on Saturday night, will be thanking his lucky stars the Warriors found a way to win that game. We’ve discussed Kata’s qualities — good and bad — a lot this year, and it was much the same against Cronulla. In particular, there were great signs in his front on defence, and you have to keep reminding yourself that he’s only 20. But, dropping the ball over the line like he did in the 66th minute was truly criminal. 3) Jonathan Wright, you’re really growing on me. That’s three games in a row now that I can’t think of a single thing you’ve done wrong. Wright has certainly generated some criticism throughout the season so far — and I’ve been as guilty as anyone — but I’m coming around. Saturday night was his best game in a Warriors jumper, doing all the basics right, scoring a try and making a crucial try-saving tackle on Mitch Brown. There’s no way Coach Cappy can leave him out if he plays like that and, if that’s the case, I’m happy to be proved wrong all year. 4) What’s wrong with the link between Shaun Johnson and Tui Lolohea? Whether it is Lolohea or Tomkins at fullback, at least once or twice a game there’ll be a Townsend to Johnson to the fullback set play. But almost every time Johnson passes (or tries to pass) to Lolohea in these situations, the timing is off, with the ball going out the back or the play breaking down. I can’t pinpoint the exact issue, but I’ll certainly be watching for it when Tomkins comes back from injury to see if anything changes. 5) Let’s take a second, as we do most weeks, to celebrate Manu simply being too big, too strong. You just don’t stop him if he gets any space and/or momentum within 5–10 metres of the line. I’d love to see him in space a little more, and this sternum injury is concerning, but, once again, Big Manu showed his quality. 6) How many weeks does Konrad Hurrell cop from the judiciary? Well, I predicted the Hurrellcane would cause collateral damage, but I didn’t see this one coming. There’s no intent to cause injury, and it could be argued that Anthony Tupou has simply got his head in the wrong position. But you can’t argue with the fact that lifting your knee is against the rules, for precisely the reason demonstrated in that incident, and it’s a habit both Konrad and Solomone Kata need to get out of their game. Because of the severity of Tupou’s injury, I wouldn’t be surprised if Konrad gets a hefty ban, causing a major reshuffle against the Eels if The Beast is also sidelined with injury. 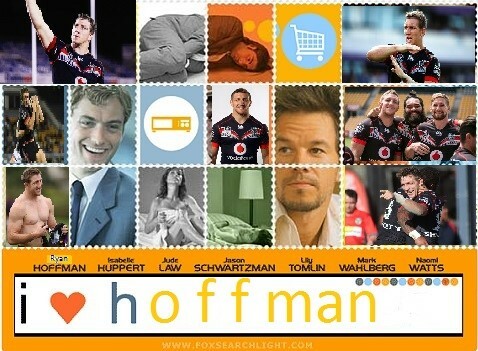 I heart Hoffman. That is all. There are very few things in this world that create total, unbridled joy — the kind where you lose full control of your limbs and your inhibitions. For me, this is the real beauty of sport. One moment can bring uncontrollable excitement, break down all barriers between strangers and even wash away years of heartbreak and disappointment. Being a sports fan can be tough work at times, but moments like Saturday night make it all worthwhile. Soak this up Warriors’ fans. We’ve been on the other side of last-minute losses already this year, and it will happen again, so make sure you enjoy these victories when you can. So, just for you, here’s a few more clips worth a watch. This list could have gone on and on, but hopefully there’s something in there you’ll enjoy. Does number 10 look familiar?